13th Friday, Everything Down : Twitter ,You tube & Blogger ! Twitter is down and fail whales abound. Some users have experienced problems loading the service since about 1:30 ET. Twitter announced that it is aware of the situation on its status log: “We are currently experiencing site stability issues. 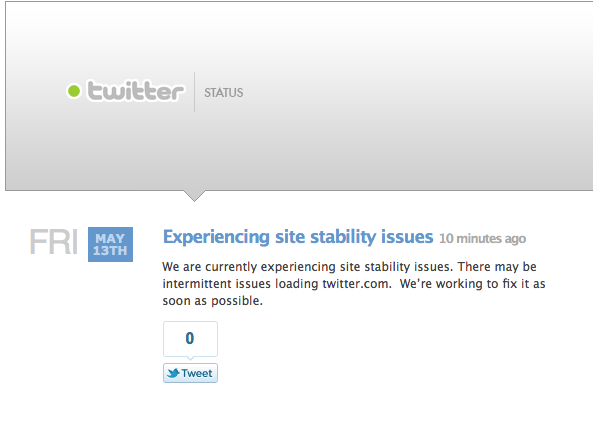 There may be intermittent issues loading twitter.com. We’re working to fix it as soon as possible,” the post says. We’ll continue to update you with more information, as it becomes available. Today Blogger.com was also down from last 48 hours, But Finally, Blogger.com is back !